THE SYDNEY Swans could be without lockdown defender Nick Smith for a likely qualifying final showdown against a Fremantle side boasting Michael Walters and Hayden Ballantyne. That is the suspicion of leading medico Dr Peter Larkins, who said the right hamstring injury Smith suffered against St Kilda on Sunday may sideline the All Australian back pocket for up to three weeks. The Swans must, of course, account for Gold Coast at the SCG on Saturday night to book their top-four spot. “It won’t be a high-grade strain but it will be enough, you would suspect, that it’s going to cost him a couple of weeks and maybe three,” Larkins told AFL.com.au. Richmond vice-captain Brett Deledio should be fit to take his place in the team for Friday night’s important clash with North Melbourne. The Tigers star forward is still feeling the effects of a jarred neck sustained in a dangerous tackle applied by Bomber Courtenay Dempsey. Richmond has ruled out a concussion, although Larkins is not so sure. “He had a sore neck out of that reportable incident and he’s likely to be right to play,” Larkins said. “Whether or not there was a minor concussion is contentious because there wasn’t time left (in the game) to go through the concussion process. “But it was interesting his own comment was ‘I came to when the trainers were treating me on the ground,’ so that tells me that he didn’t know where he was and he at least was somewhat disorientated and therefore potentially concussed. “By that very comment, it tells me that there was more than just a simple jarred neck. West Coast defender Jeremy McGovern will likely get up for Saturday’s battle with St Kilda at Domain Stadium, according to Larkins. “McGovern landed awkwardly on his left shoulder and jarred it very heavily which involved an AC joint compression injury and bruising of the shoulder,” Larkins said. “There’s nothing too complicated with that but I’d expect he’ll be sore this coming week and they’ve got an option of playing him with strapping on the shoulder or giving him the week to get it right. But the news may be worse for Docker defender Cameron Sutcliffe, who faces a tough decision about whether to undergo season-ending shoulder surgery or a short conservative rehab period and return later in the finals. 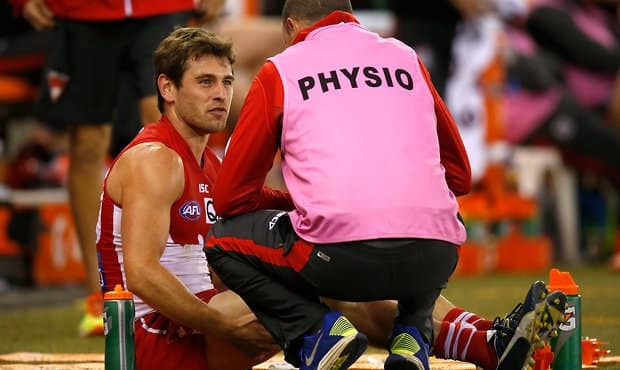 “Sutcliffe dislocated his right shoulder in the final quarter of yesterday’s (Sunday’s) game against Melbourne,” Larkins said. “I believe it’s a first-time dislocation so that puts him in a really difficult position. It’s extremely rare when players have a had a complete dislocation and not had the surgery that they can carry the loose shoulder all season although we’ve seen it with (Hawthorn’s) James Frawley this year. Larkins labelled star midfielder Nat Fyfe a “week-by-week proposition” as he tries to recover from stress inflammation of the fibula in his left leg. Fremantle expects Fyfe to be available for a likely match-up with the Swans in the first week of the finals, although Larkins doubts whether he will be 100 per cent fit. “It depends on how much the inflammation in the bone settles down into week three as to whether he can do much running, so it’s going to be based on the pain that he’s got,” Larkins said. – Docker forward Michael Walters, who was a late withdrawal against Melbourne because of a tight calf, would benefit from another week on the sidelines before finals. – Star Cat Steven Motlop is in some doubt to play in Saturday’s clash against Adelaide at Simonds Stadium after pulling up sore from a knock on the patella tendon on Friday night. – Magpie star Dane Swan is in “serious doubt” for Sunday’s dead-rubber against Essendon due to a medial ligament strain in his right knee. – Pies defender Ben Sinclair would require surgery to fix a break in his hand. He would likely be out of action for three to four weeks during a normal period in the season. – Carlton utility Chris Yarran (hamstring) would miss this weekend’s clash with Hawthorn, meaning he may have played his final game for the club as the trade talk around him intensifies.